This entry was posted on May 1, 2014 by Ashlea Jade, in PROJECTS and tagged construction, Decor, Decorator, design, designer, Hoboken, interior, Interior Decorator, Interior Decorator Hoboken, interior design, Interior Design Hoboken, Interior Designer, Interior Designer Hoboken, renovation, Swift Morris Interiors, the bloomfield project, Tiling. Bookmark the permalink. With the Bloomfield Project’s finishing date fast approaching, this month has been all about ‘pulling it together’. 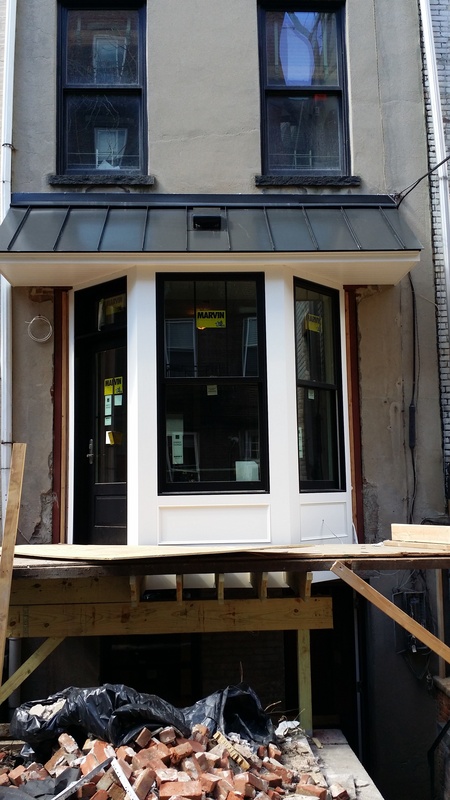 We have been extra busy installing the tiles, repairing the original hardwood floors, constructing bespoke wooden cabinetry, finalizing the window and roofing construction and installing all of the custom doors. Scroll down to see all our latest developments – things are really coming along! 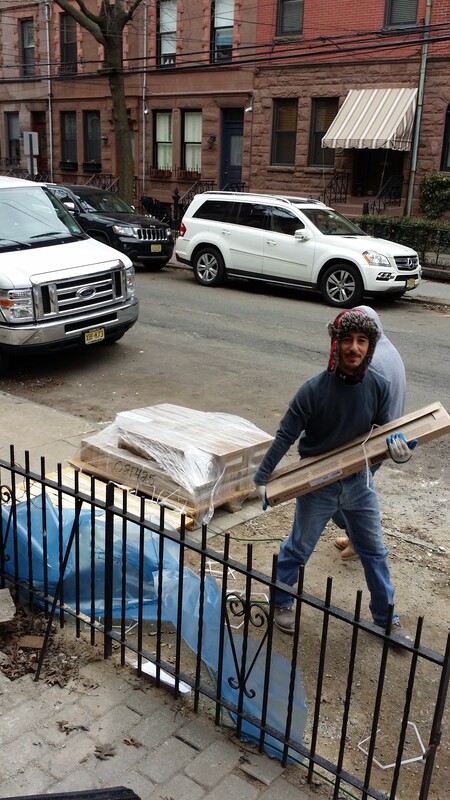 The men unpack the pallet of tiles – now ready to be installed! 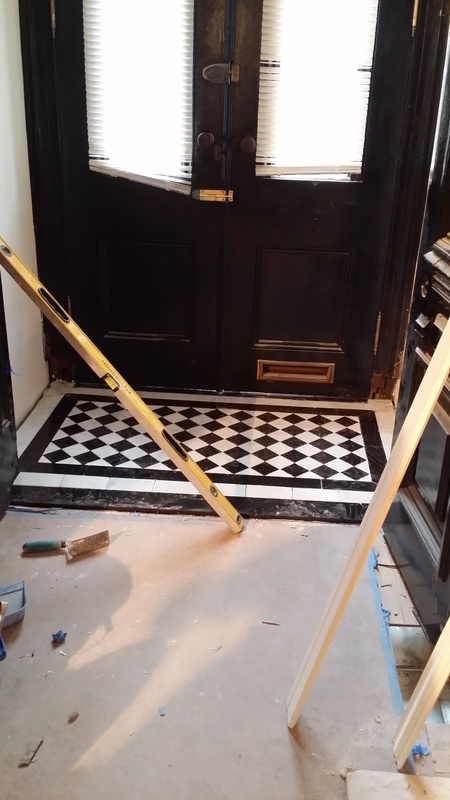 The foyer monochrome tile is set in place. Oh boy, what an entrance! 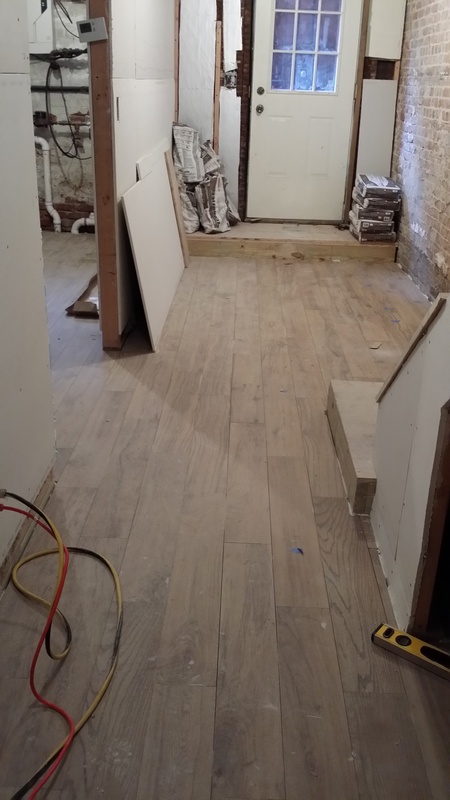 On the basement level, a porcelain wood-like tile is laid. This is a great alternative to hardwood floors, as the porcelain tile is eco-friendly, low in maintenance and still provides the warmth of real wood. It looks and feels just like the real thing – can you tell the difference? 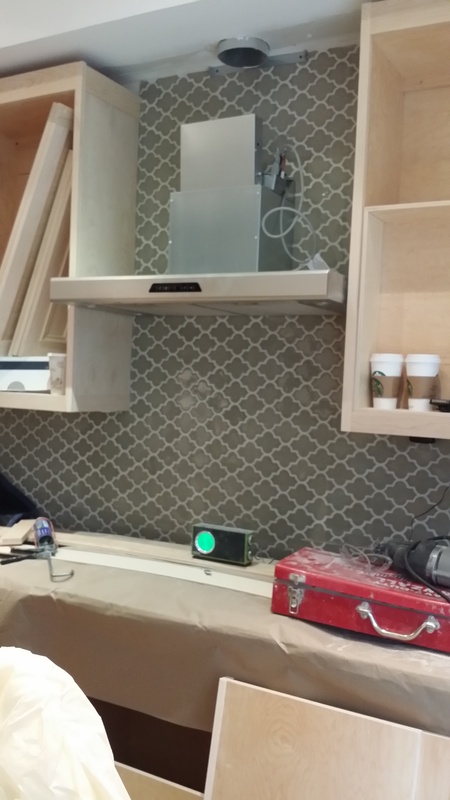 With the bespoke kitchen cabinets in place, the celadon green Moroccan pattern backsplash is completed. 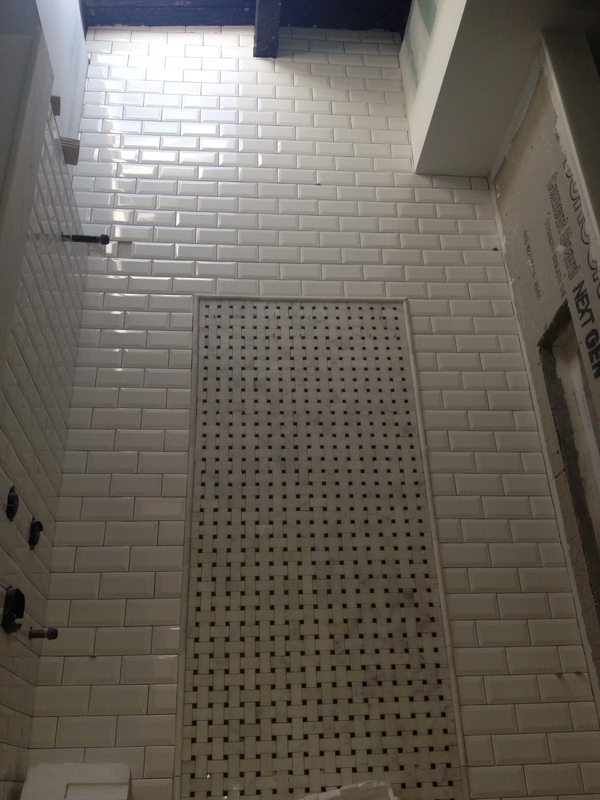 Pictured below, the master bathroom shower and exposed brick wall is ready to be tiled. 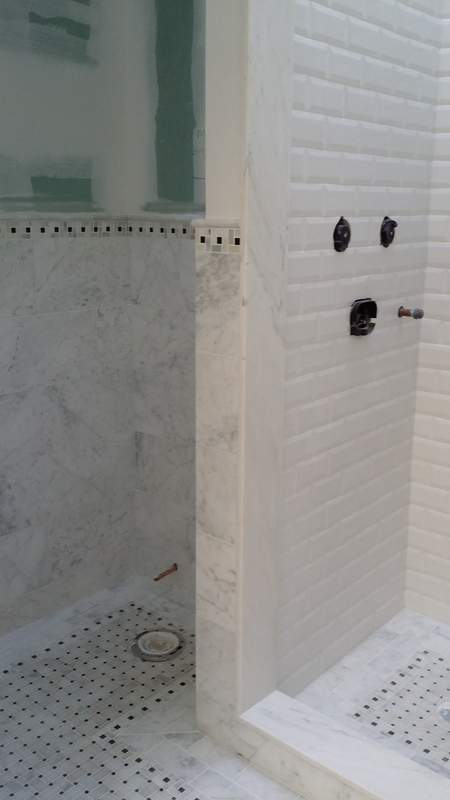 A classic white subway tile is chosen for the dramatic 12 feet-high shower wall. This will be a stunning space, especially with the sun streaming in though the sky-light. 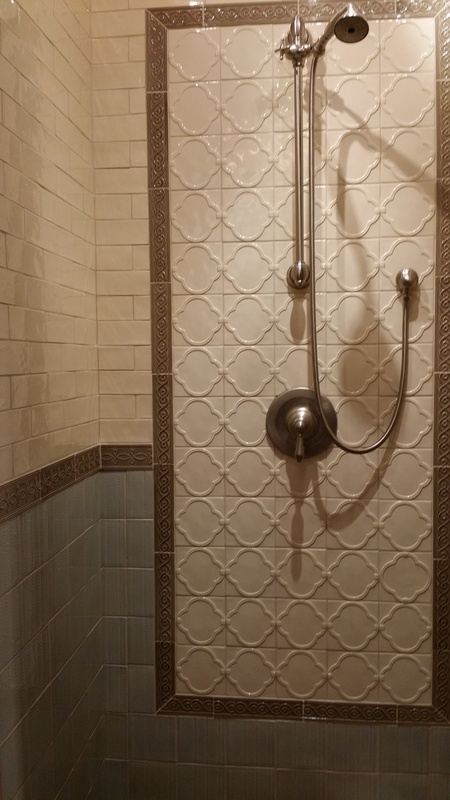 We love the decorative tile used in the guest bathroom… just wait until you see this room finished with the wall paper! 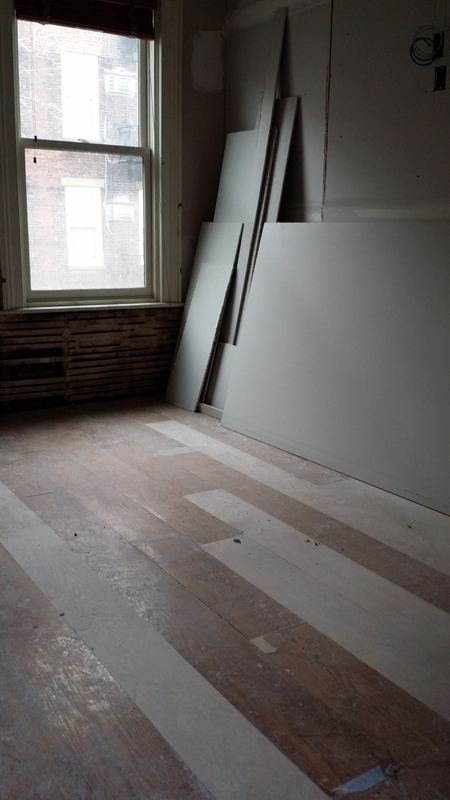 Below, the original hardwood floors are repaired before refinishing. 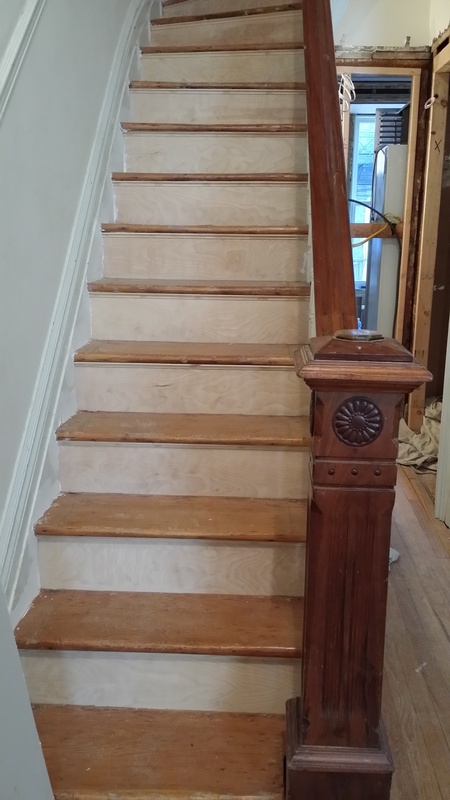 The original staircases are reinforced… no more squeaks! Other noteworthy developments this month include the installation of the roof over the kitchen bay window. Clearly the garden still needs some work… excuse the rubble! 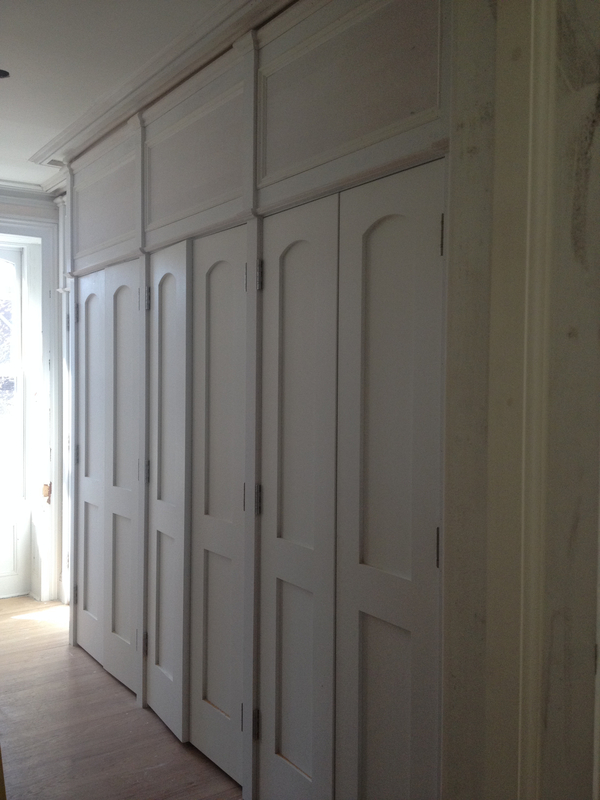 Thanks to our fabulous team of carpenters, the upstairs dressing room was lined with floor to ceiling wardrobes. Who has closet envy? As you can see, we have had an extra busy month, pulling together the tiling installation, floor repairs, and much, much more! And, if we keep on track we should have our final construction pictures for you very shortly, so make sure you check back in with soon.